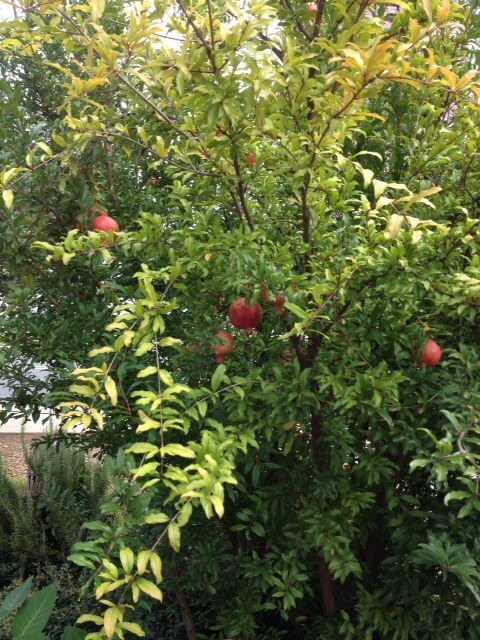 Before I wrote the novel, I hadn’t noticed pomegranates, particularly. They were slightly astringent, sweet fruits that I could never peel well. And the thought of eating seeds seemed like too much work. Wait a minute. I’ve never really tried to peel one, I thought. I’ve only eaten pomegranates as a garnish here and there. And they have that lovely ruby color. Why not try it? I learned to harvest the seeds easily by holding the pulp under running water, and have enjoyed them tremendously ever since. And then I began seriously cultivating Eve’s Garden. In these regions, femininity is covered, hidden, and often exploited in modern times, but celebrated in many of the ancient cultures that gave rise to the modern world. It is the ancient meaning for “Punica” or pomegranate as “apple” that many scholars believe was at the root of the apple in the Garden of Eden, a location which many consider most likely to have been in the pomegranate’s native habitat of Central Persia. For me, that knowledge of good and evil is a metaphor for the fruit of the womb, which can be both blessing and burden for women. Which is ours alone to figure out. Don’t tell me it doesn’t matter if we elect women. Yesterday, seven Democrats voted with the anti-choice Republicans to avoid tabling Ben Nelson’s amendment that would have restricted women’s ability to pay for abortion coverage with their own funds, if they received federal subsidies for health care. A no vote was a vote to keep the amendment alive. Voting Yes to table the amendment, and thus, effectively, to kill it, were all the Senate’s women except two––Kay Bailey Hutchison, who is running for Governor of Texas at the end of her current term, and Lisa Murkowski of Alaska, who has been tap-dancing for the daddies for a very long time. All the other women, including Republicans Olympia Snowe and Susan Collins of Maine, voted to table the amendment. It was the outrage expressed by the women that brought this issue to a head. Barbara Boxer asked, pointedly, for what medical procedure men would be forbidden to use their private funds. Dianne Feinstein railed against the unfairness of using health care as a fulcrum to leverage more restrictions on abortion. Even Claire McCaskill–-she who repeated every shopworn “ambitious women are harpies” claim against Hillary Clinton––said bluntly that she could not support such restrictions under any circumstances. Read my lips, Harry––if we have to take health care reform down to keep our right to privacy, we will, and then we’ll point the finger at you. There is still the reconciliation session when the House’s loathsome Stupak amendment will have to be meshed with whatever the Senate approves, and no doubt the ugly Dems–the ones Rahm Emanuel insisted we should elect in swing districts––will try to further legislate away our rights to fulfill their religious beliefs. But I believe that the resolve of the Senate’s women will strengthen the hands of women and men in the House to do what’s right. Should it matter whether your Senator is male or female? No. Does it? Oh, yes. And it will, until powerful men stop trying to make women bear the burden of political horse-trading. Most likely, that won’t happen until women have more parity in both Houses of Congress and around the world. You don’t trade away the rights of the strong.